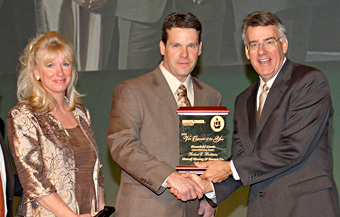 Metcalf’s own Eric Brittain was named driver of the year in the household goods division. Eric and his wife, Laura, were in Colorado Springs, CO, to accept this prestigious award from Mayflower president, Rich McClure. Eric was chosen to receive this award based on meeting a wide range of criteria, including claims prevention, an exceptional safety record, overall superior performance, and superior customer satisfaction. Eric has been with Metcalf Moving & Storage since 1990.